The report below was updated and revised in February 2019. The federal government taxes income from wealth less than it taxes income from work. One type of income from wealth is capital gains, the profits investors receive when they sell assets for more than their cost. Capital gains are undertaxed in the United States but some policymakers have argued otherwise, claiming that capital gains are overtaxed because some of these profits are really the effects of inflation and not real income. They argue that Congress, or even the administration, should provide a new break that would lower income taxes on capital gains even further. But, as this report explains, the existing tax breaks for capital gains more than compensate for any problem related to inflation. Congress should repeal or limit these existing breaks rather than create new ones. One of the existing tax breaks is the special, lower personal income tax rates that apply to both long-term capital gains and corporate stock dividends. (Capital gains are considered long-term when assets are held for at least a year before being sold.) Figure 1 illustrates the distribution of the benefits from these lower rates projected by the ITEP microsimulation tax model. The total projected cost of these lower rates in calendar year 2020 alone is $141 billion. Of that amount, 78 percent is projected to go to the richest 1 percent of Americans while 90 percent is projected to go to the richest 5 percent. The special personal income tax rates that are addressed by Figure 1 are just one of several types of tax breaks for capital gains. Congress could save hundreds of billions or even trillions of dollars by repealing some and restricting others, as explained in this report. The capital gains tax breaks also contribute to inequality because most capital gains income is received by the richest 1 percent. Any plan for true, comprehensive tax reform should address each of the following types of capital gains tax breaks. The special, low income-tax rates that apply to capital gains (and stock dividends). These special rates allow investment income, which mostly flows to the richest Americans, to be taxed less than income from work. The exclusion of capital gains on assets passed to heirs or to charity from taxable income. This break mainly subsidizes wealthy families who hold assets to pass them onto the next generation, increasing the sort of dynastic wealth that is a feature of income inequality. For assets that are not passed onto heirs but instead sold, the ability to defer paying tax on gains until the sale of the asset. When the value of an asset rises, for all practical purposes that increase in value is income for the owner of the asset, but our current laws do not tax this income until the asset is sold. This means that wealthy individuals who own most assets can defer paying tax on much of their income for years, allowing their wealth to grow much more rapidly, while most income of working Americans is taxed annually. To end the first break, Congress would simply repeal the special income tax rates for capital gains and stock dividends, which would simplify the tax code because all income would be subject to the same set of tax rates. To end the second break, Congress would pass legislation to tax such assets. The transfer of an asset at death would be treated the same as a sale during the owner’s lifetime, meaning gains would be taxed as income. A certain amount of gains on assets left at death could be excluded to shield low- and middle-income families from the effects of this reform. In the case of capital gains on closely held business assets (assets of a family business) left to heirs, the tax could be paid over 15 years to avoid liquidity problems. The third break, the deferral of income tax on capital gains, is the most complicated to address. At a minimum, Congress should address some of the most egregious tactics used by the wealthy to take advantage of this tax deferral. Congress should at least eliminate so-called “like-kind exchanges” and subject derivatives to “mark-to-market” taxation, which means capital gains generated by derivatives would be taxed each year regardless of whether any sale occurs. Congress could even go further and subject all assets held by the richest Americans to mark-to-market taxation or its equivalent. As this report explains, one comprehensive proposal for mark-to-market taxation would eliminate the benefit of deferral of taxes on capital gains entirely for the very richest 0.1 percent of Americans, who are more than equipped to comply with the complicated tax rules involved. These three reforms would work together and reinforce each other. For example, ending the exclusion of capital gains on inherited assets and limiting the benefit of tax deferral on capital gains would make it easier to raise revenue with higher income tax rates on capital gains. In the past, some analysts concluded that higher income tax rates on capital gains would not raise revenue because wealthy individuals would hold onto their assets longer, perhaps even until they die, to avoid the tax increase. Academic David Kamin writes, “The JCT [Joint Committee on Taxation] and Treasury both assume that the revenue-maximizing rate for capital gains revenue ranges from 28 to 32 percent.”  Any rates higher than that are thought by some to reduce revenue because of the techniques used by wealthy owners of assets to avoid the tax. Kamin was writing with the assumption that no other changes were made to tax law. But the package of reforms discussed here would block those tax avoidance techniques, meaning the revenue-maximizing tax rate for capital gains would likely be much higher. Figure 2 provides the estimated revenue impacts of some of these reforms and assumes that there are no “behavioral responses” to the tax changes that reduce the amount of revenue collected. In this context, behavioral responses are essentially ways that people with assets avoid tax increases. Because these reforms reinforce each other and, together, block most of the paths that wealthy people would otherwise take to avoid paying taxes on capital gains, there may be little in the way of behavioral responses that restrict the revenue savings. (Calculations are explained in the methodology section of this report.) Figure 2 illustrates how much revenue Congress can raise by reforming capital gains taxes, even without the most ambitious reform option (mark-to-market taxation for the richest taxpayers). Even if one assumes that behavioral responses do have an effect, it is difficult to see how this package of reforms could fail to raise significant revenue. For example, even if behavioral effects reduced the revenue impact of these reforms by a third, they would nonetheless raise more than $1.6 trillion in revenue over a decade. These reforms would simplify the tax system overall because they would eliminate the existing incentives for wealthy individuals to disguise their income as capital gains. To take just one example of such a scheme, wealthy managers of private equity funds characterize their compensation as “carried interest,” a share of profits on investments, even though this income is actually compensation for their services. (The new tax law slightly narrows the carried interest loophole but leaves it almost entirely intact.) The tax code has many, many rules to prevent taxpayers from manipulating their income to characterize it as capital gains, but these schemes persist and they benefit the wealthy almost exclusively. Capital gains, which are profits on the sale of an asset, and stock dividends paid by corporations are both subject to lower personal income tax rates than other types of income. To be eligible for lower rates, capital gains must be long-term, which means the asset has been held for at least a year. The highest-income taxpayers are subject to a top personal income tax rate of 37 percent on “ordinary” income but just 20 percent on long-term capital gains and stock dividends. The Affordable Care Act (ACA) imposes a net investment income tax of 3.8 percent and sets a top rate of 3.8 percent for the Medicare tax on earned income. Including those two ACA taxes, the top tax rates are 40.8 percent for ordinary income and 23.8 percent for long-term capital gains and stock dividends. As illustrated in Figure 1, 78 percent of benefits of the lower personal income tax rates will go to the richest 1 percent in 2020. The special capital gains and dividends rates result in people at the same income level paying very different tax rates simply because they have different types of income. For example, a person who does not work but has $200,000 in dividends and capital gains from stocks sold by his broker would pay lower taxes than a person who earns $200,000 from work. The special income tax rates can also result in extremely wealthy people paying a lower marginal tax rate than some middle-income people. For example, consider a childless married couple with $55,000 of earnings and no other income. If they claim the standard deduction and have no other tax breaks, they would be in the 12 percent personal income tax bracket, meaning a portion of their income is taxed at a rate of 12 percent. All their earnings are also subject to Social Security and Medicare payroll taxes which come to about 15 percent. The couple’s total marginal tax rate (the tax rate that would be paid on an additional dollar of income) is therefore around 27 percent. Compare this to an investor who has $4 million in long-term capital gains and stock dividends and no other income. This investor is in the top personal income tax bracket, where capital gains and dividends are taxed at 20 percent, and also pays the ACA tax on investment income at a rate of 3.8 percent. This investor’s total marginal tax rate is therefore 23.8 percent. This is the unfairness that the billionaire investor Warren Buffett decried when he famously explained that he paid a lower effective tax rate than his secretary. Defenders of special rates also argue that behavioral responses prevent higher rates on capital gains from raising revenue. Some have tried to connect every drop in capital gains tax revenue to an increase in tax rates on capital gains, and have tried to connect every rise in capital gains tax revenue to a drop in the rates. For example, the Tax Reform Act of 1986 raised rates on capital gains so that they would be taxed like other income. Advocates of tax breaks for investment income have argued that this caused a drop in capital gains tax revenue. The truth is that the 1986 law did create a short-term behavioral impact among investors. Many of them sold assets right before the law went into effect to benefit from the lower rates for capital gains before they disappeared. 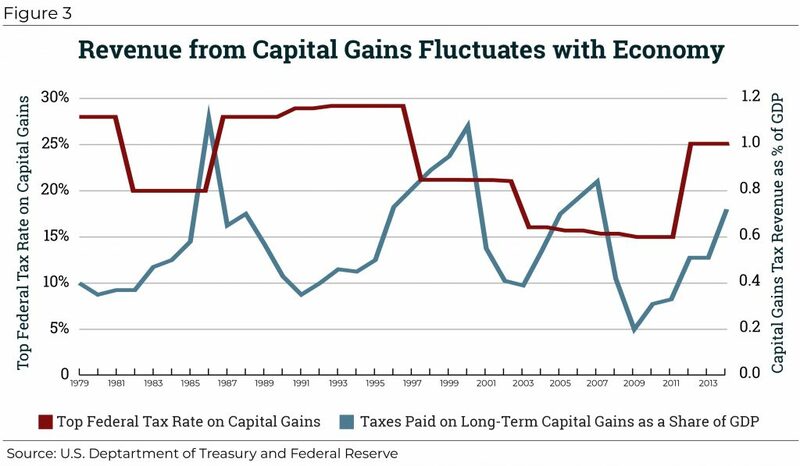 This drove up the tax revenue collected on capital gains, and thus revenue dropped back to its natural level when the law went into effect. Even if behavioral responses to tax changes do limit the revenue that can be raised by increasing the capital gains rate to some extent, other reforms described in this report are likely to counteract those behavioral responses, as already explained. The next two sections of this report describe those other reforms. 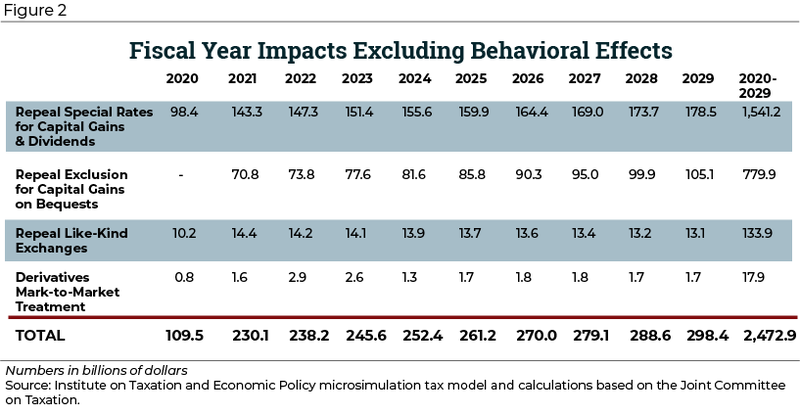 As illustrated previously in Figure 2, eliminating special rates could raise $1.9 trillion over the next decade if there are no behavioral effects that limit the revenue impact. Now consider another person who buys a share of stock but, because he has less income overall, is forced to sell it to finance his retirement. He buys the stock for $100 and, 20 years later, sells it for $1,100. He is required to pay tax on the $1,000 capital gain. It seems unfair to tax this person dramatically differently than the person in the previous example. In addition, allowing taxpayers to exclude gains on assets left to heirs is a technique that, if not eliminated, would restrict the amount of revenue Congress could raise by repealing the special tax rates for capital gains. In other words, higher tax rates on capital gains could induce some wealthy individuals to simply hold onto their assets until death so that their family avoids the tax altogether. In 2015, the Obama Administration proposed a version of this reform that was weaker than what is outlined here. For example, the Obama proposal did not apply to gifts or bequests to charity, which would lessen the revenue impact of the reform. The Obama proposal also did not apply to assets of family-owned and family-operated businesses. It seems likely that wealthy people would go out of their way to characterize their assets as family business assets if this proposal was enacted, further reducing its effectiveness. Even if an investor does want to sell an asset at some point during her life, the tax code still offers a significant break by allowing the tax on capital gains to be deferred until the sale. Most types of income that low- and middle-income people rely on — income like wages and interest — are taxed each year as they are earned. But capital gains on assets — the majority of which goes to the richest 1 percent of Americans — are taxed only when assets are sold. Capital gains on an asset that is held for several years will therefore grow much more rapidly than they would if they were taxed each year just like other types of income. Figure 4 provides an example of how the deferral of income tax on capital gains could benefit a wealthy individual. Under current law, a taxpayer can invest $5 million in stock of a particular company and if the stock appreciates at an annual rate of 17.5 percent, its value will be $25 million a decade later, with no income tax paid on any of the $20 million in “unrealized” capital gains. Even if the special income tax rate on capital gains is repealed, deferral will still provide a significant tax break. If the taxpayer decides to sell the stock at that point, after owning it for a decade, she would owe 40.8 percent on the $20 million of capital gains. (That is the top personal income tax rate of 37 percent plus the net investment income tax rate of 3.8 percent.) If she sold some of the stock to pay the tax, she would be left with $16.89 million of stock. But consider what would happen if the gains on the stock were taxed the way interest on a bank account is taxed, which is what mark-to-market taxation would accomplish. The stock’s gains would be taxed at a rate of 40.8 percent annually. If the taxpayer sells some of the stock to pay the tax, then each year the taxpayer would begin with a smaller amount of stock, so even assuming it continues to grow at an annual rate of 17.5 percent, by the end of the decade the taxpayer would be left with a smaller after-tax total, $13,399,000. The ultimate tax bill would be nearly $3.5 million higher because the gains on the stock are taxed annually, just like interest or wage income that accounts for most income of working-class Americans. Despite the enormous benefits that this type of deferral provides to the rich, arguments for allowing it might initially seem convincing. Traditionally it was thought that the appreciation of an asset does not actually increase its owner’s ability to buy goods or services or invest until the asset is sold, turning that appreciation into cash that can be spent. But this picture does not fit today’s world, particularly the world the rich inhabit. For example, stocks and other publicly traded securities can be sold so quickly that they are almost the equivalent of money. A stockholder can easily buy and sell stocks to finance consumption or a new investment. They can also borrow against these assets to fund a wealthy lifestyle. The boldest reform would be for Congress to eliminate the benefits of deferring capital gains taxes entirely for the richest Americans. This would require imposing mark-to-market taxation, or something like it, on the very rich for all assets, rather than just derivatives. A proposal for comprehensive mark-to-market taxation devised by David S. Miller would provide this type of treatment to the assets of the richest households in a straightforward way. In certain narrowly defined situations, the tax code already marks assets to market. For example, those who hold securities as dealers rather than investors are subject to mark-to-market taxation. This simply means that any appreciation (increase in the value) of assets held by the taxpayer is included in taxable income and taxed at the end of each year, even for assets that were not sold during the year. This proposal would expand mark-to-market taxation, or its economic equivalent, to most of capital gains enjoyed by the roughly 170,000 households making up the richest 0.1 percent of Americans (measured both in terms of income and in terms of wealth). This system of comprehensive mark-to-market taxation would include actual mark-to-market taxation for publicly traded assets and “deemed” mark-to-market taxation for assets that are more difficult to value. For corporate stocks and other securities that are publicly traded, mark-to-market taxation is relatively straightforward because such assets sell on public exchanges at prices that are readily ascertained. Brokers and dealers of stocks and other publicly traded securities would be required to calculate the “unrealized capital gains” (the increased value on stocks that have not been sold) for the clients whose income or wealth exceeds the threshold that would place them among the richest 0.1 percent of Americans. Given that this is a relatively small group of individuals (170,000 households) and includes the clients that brokers and dealers value most, this requirement would not be difficult to enforce. The unrealized gains on these assets would be included in taxable income each year. Returning to the example above, consider the taxpayer who invests $5 million in stock and sees its value grow at a rate of 17.5 percent. Under current law, assuming an income tax rate of 40.8 percent, the taxpayer could sell the stock for $25 million at the end of the decade and, paying the income tax out of the capital gains, would be left with $16.9 million. If the stock is instead marked to market and the gains are taxed annually, the taxpayer would be left at the end of the decade with $13.4 million instead of $16.9 million, as illustrated previously in Figure 4. Assets that are not publicly traded (interests in real estate or closely held businesses, for example) would be too difficult to mark to market because their value is difficult to ascertain before they are actually sold. The proposal would therefore allow the richest 0.1 percent to continue deferring tax on capital gains on these assets until they are sold — but at that point would impose a larger tax that would leave the taxpayer in the same position she would be in if the asset had been subject to mark-to-market taxation each year that she owned it. This approach can be thought of as deemed mark-to-market taxation. For example, assume the taxpayer in the example above had invested in a non-tradable asset rather than in stock. Assume she bought part of a privately held business for $5 million and then sold it a decade later for $25 million. Under current law, she would pay nothing until the year of the sale, which would provide a significant break even if the special income tax rates for capital gains are repealed. She would pay 40.8 percent of the $20 million in capital gains, and if she paid the tax from the proceeds of the sale she would be left with $16.9 million. As explained above, if the asset had been a stock subject to mark-to-market taxation and part of the stock had been sold to pay the tax each year, the taxpayer would be left with $13.4 million at the end of the decade. Deemed mark-to-market taxation would produce the same result. The simplest way to think of it is that the tax imposed would be that needed to reduce the money left after the sale of the asset and after taxes are paid to the $13.4 million that would be left if actual mark-to-market taxation had applied. While this system might sound complex for an ordinary taxpayer, the group of individuals subject to it would be no ordinary taxpayers. The richest 0.1 percent of Americans do not do their taxes at a kitchen table in one evening the way a middle-class family might. The IRS recently reported that to be included in the top 0.1 of adjusted gross income earners in 2015, a taxpayer would need at least $2.22 million in AGI. The average AGI for this group in 2015 was nearly $7.3 million. Data tabulated by Emmanuel Saez and Gabriel Zucman demonstrate that to be among the top 0.1 percent of wealth holders in America in 2012, one needed to own at least $20.6 million in assets. The average net worth for this group in 2012 was $73.7 million. Needless to say, these taxpayers already have professionals handling their finances and their taxes and are therefore able to adapt to tax rules that would be overly complex for the typical taxpayer. Miller formulated this proposal in 2015 and estimated that it would raise $1.6 trillion over a decade. Assuming this proposal would apply under the top ordinary income tax rate in effect today (which has been reduced by Tax Cuts and Jobs Act, or TCJA) the revenue impact would be somewhat lower. Even if Congress does not take on the ambitious proposal for comprehensive mark-to-market taxation, it could at least address the worst abuses of deferral of tax on capital gains. This is particularly true of the schemes used by wealthy individuals to continue deferring tax even when they have, for all practical purposes, sold the asset in question. At a minimum, Congress can block two of the most egregious of these schemes, which involve derivatives and like-kind exchanges. Several high-profile individuals have used derivatives to turn their assets into cash while technically avoiding a sale that would trigger income tax. A derivative can be thought of as a contract between two parties to make some sort of transaction and which has a value derived from the asset involved in that transaction. A derivative might be useful, for example, for a farm that wants to ensure that it can sell crops at some price in the future. However, derivatives can also be used to create contracts that are, for all practical purposes, sales of assets but that technically do not result in an actual sale for several years, thus allowing deferral of taxes on capital gains even beyond what policymakers ever contemplated. Ronald S. Lauder, heir to the Estée Lauder fortune, entered into a contract to “lend” $72 million worth of stock without paying taxes on the capital gains until several years later, when the stock was technically sold under the contract, which was a type of derivative. Billy Joe “Red” McCombs, the co-founder of Clear Channel and former owner several sports teams, David H. Murdock, the Dole Food Co. Chairman, and Maurice “Hank” Greenberg, the former AIG chairman and CEO, all used the same type of derivatives to defer taxes on hundreds of millions of dollars. The IRS did decide that McCombs’s contract was actually a sale and that he owed $44.7 million in taxes, but then settled for just half that amount. Even if lawmakers decide that marking a wide variety of assets to market would be too complicated, they should at the very least block these schemes by enacting mark-to-market taxation for derivatives. In 2017, Sen. Ron Wyden introduced the Modernization of Derivatives Act (MODA) to accomplish this. Derivatives would be subject to mark-to-market taxation, meaning any annual increase in their value would be treated as a taxable capital gain, which would be subject to ordinary income tax rates under MODA. The scheme used by Lauder and others would no longer produce tax savings. It would not matter if the taxpayer claimed that an asset was not technically sold, because taxes on capital gains for derivatives would no longer be deferred. The Joint Committee on Taxation (JCT) estimated that MODA would raise less than $20 billion over a decade. But that revenue estimate may not sufficiently capture how important this reform would be, particularly if Congress raises income tax rates on capital gains, tempting more super-wealthy individuals to use derivatives to avoid the tax increase. Section 1031 of the tax code allows a taxpayer to trade a property for another that is, in theory, a similar property without recognizing any gain and thus putting off paying income tax on that gain. This is a so-called “like-kind exchange.” Whereas most working people must pay income taxes on their income each year, these investors can put off paying income taxes on capital gains (which may be their main source of income) for years by trading appreciated assets rather than selling them. But this tax break has turned into a multi-billion-dollar loophole. The term “like-kind” has been stretched beyond all recognition. For example, in one case a trade of Midwestern farmland for a Florida apartment was considered a like-kind exchange. These exchanges are not the arrangements between farmers that one might imagine. Investors who want to sell property to willing buyers with cash use brokers who find property from another party that qualifies as “like-kind” to insert into the deal. The recently enacted TCJA eliminated like-kind exchanges for property other than real estate. This seems to have left more than a third of the tax break in place. The Joint Committee on Taxation estimates that like-kind exchanges (now limited to real estate) will reduce federal revenue by $7.1 billion in 2018 alone. As explained in the appendix, JCT estimates the revenue lost from like-kind exchanges assuming current tax rates, including the special low tax rates for capital gains. If Congress eliminated the special tax rates for capital gains, then the revenue raised from eliminating like-kind exchanges would be much greater. Because of the tax breaks described in this report, capital gains income is taxed much less than other types of income. Despite this, some lawmakers and commentators have lately called for an additional tax break for capital gains. They point out that some portion of capital gains merely reflects inflation rather than a real increase in the value of the asset. Turn back to the example in Figure 4 of the individual who invests $5 million in an asset that she sells for $25 million 10 years later. If the rate of inflation was 6 percent throughout that period, a $5 million asset would appreciate to $9 million if it merely kept up with inflation. If the individual sold the asset at the end of the decade for just $9 million she would not be able to purchase any more with that $9 million than she could 10 years earlier with the $5 million she had invested. The $4 million of appreciation was due to inflation rather than an increase in value in real terms. The portion reflecting inflation, it is argued, should not be counted as income at all. 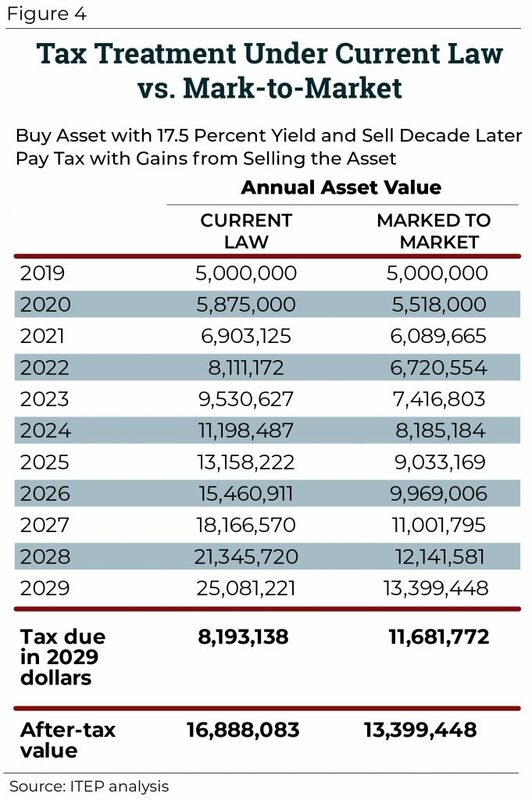 Under this proposal, if the individual sold the asset for $25 million at the end of the decade (as in the example illustrated by Figure 4), then she would be taxed on $16 million of capital gains rather than $20 million because the $4 million due to inflation would be excluded. The argument may initially seem compelling but ultimately fails for several reasons. First, the tax code already provides enormous breaks for capital gains, as already explained in this report, which more than compensate for any problem related to inflation. Researchers using the Penn Wharton Budget Model (PWBM) have estimated that indexing capital gains for inflation would reduce revenue by $102 billion over a decade. The existing breaks for capital gains lose far, far more revenue than this, which indicates that the existing tax breaks more than compensate asset owners if they are sometimes taxed on inflationary gains. Early in this report, Figure 2 illustrates how the special tax rates, the exclusion of capital gains on assets left to heirs, and the most egregious breaks related to the deferral of capital gains taxes together cost nearly $3 trillion over a decade. Second, capital gains income is affected by inflation less than other types of investment income because taxes on capital gains are deferred until the sale of the asset. Part of the tax that is deferred on a capital gain is the tax on the gain that is merely the result of inflation. Assume that the taxpayer in the example above bought the asset for $5 million and sold it a decade later for $9 million. If the rate of inflation was 6 percent during that period, then the appreciation on the asset only kept up with inflation. Assume that a second taxpayer lent $5 million to a bank by depositing it in a savings account that paid an interest rate of 6 percent and did not withdraw from the account until 10 years later. In this case, the interest paid on the savings account is merely reflecting inflation, just like the appreciation on the asset purchased by the first taxpayer. The asset appreciates at a rate of 6 percent, the savings account accumulates interest at a rate of 6 percent, and the rate of inflation is 6 percent. If there was no income tax, both taxpayers would have $9 million at the end of the decade. Both taxpayers would have enough money to purchase what they could have purchased with $5 million a decade earlier. In the real world, the income of both taxpayers is subject to tax even though the income could be argued to reflect only inflation. But the inflationary income on the savings account is taxed much more than the inflationary income of the appreciated asset. As illustrated in Figure 5, the bank account holder is left with less money at the end of the decade even if we assume both are subject to the same marginal tax rate. 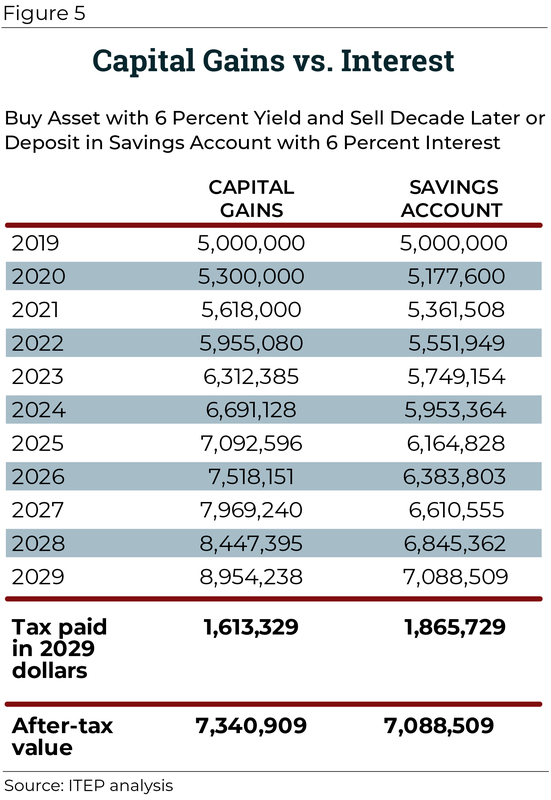 (Interest on the savings account is treated the way capital gains would be treated if assets were marked to market). In this scenario, both taxpayers have income that merely reflects inflation, but the savings account holder is taxed more and left with less, compared to the investor with the appreciated asset. Third, indexing capital gains for inflation would lead to vast opportunities for tax avoidance. For example, consider what would happen if the two examples just discussed were combined. The person who wants to purchase an asset for $5 million borrows the money and purchases the asset, which then appreciates at a rate of 6 percent. Since this appreciation is all inflation, it would not be taxed under this proposal. But, at the same time, the borrower can deduct the interest he pays to the lender, even though the interest is also entirely the effect of inflation. This means the borrower is willing to use debt to finance an investment that would not be profitable except for a loophole that arises because one part of the tax code is adjusted for inflation and another is not. The borrower would even be likely to pay a slightly higher interest rate to the lender to take advantage of this loophole, making the deal profitable for both parties. Of course, it is possible for Congress to devise rules to prevent this type of arbitrage, but they would add much complexity to the tax code and it is unclear that they could be effective. The PWBM estimates already mentioned did not take into account the types of abuses that could arise if indexing is implemented. These abuses would likely lead to much greater revenue losses. Estimates of the revenue impact and distribution of eliminating the special income tax rates on long-term capital gains and stock dividends were generated with the ITEP microsimulation tax model. The model estimates the impacts of tax policies and proposals on a representative sample of taxpayer records that is updated each year to reflect the nation’s population. The distributional estimate generated by the model is reflected in Figure 1 and the revenue estimate is included in Figure 2. Two other revenue estimates included in Figure 2, the estimates for taxing capital gains on assets left to heirs and eliminating like-kind exchanges, began with the tax expenditure report published by Congress’s Joint Committee on Taxation (JCT). The tax expenditure report estimates the revenue that the federal government forgoes each year because of these provisions. In doing so, the JCT report assumes current law tax rates, meaning they assume the preferential tax rates on capital gains would apply. This analysis starts with the JCT tax expenditure estimates for capital gains on assets left to heirs and like-kind exchanges and then increases them by 74 percent, which is the additional tax that would be paid on all gains, as calculated by ITEP, if gains were subject to ordinary rates instead of preferential rates. The estimate in Figure 2 for marking derivatives to market begins with JCT’s estimate of the Modernization of Derivatives Tax Act (MODA) and makes an adjustment to reflect that the provision would not go into effect until 2020. The ITEP microsimulation model estimates the impacts of tax policies on a representative sample of taxpayer records. For more information, see the ITEP Microsimulation Tax Model Overview, https://itep.org/itep-tax-model-simple/. David Kamin, “How to Tax the Rich,” January 5, Tax Notes. http://taxprof.typepad.com/files/kamin.pdf Kamin writes, “The JCT [Joint Committee on Taxation] and Treasury both assume that the revenue-maximizing rate for capital gains revenue ranges from 28 to 32 percent.” In footnote 7 of is article he explains that range of rates. 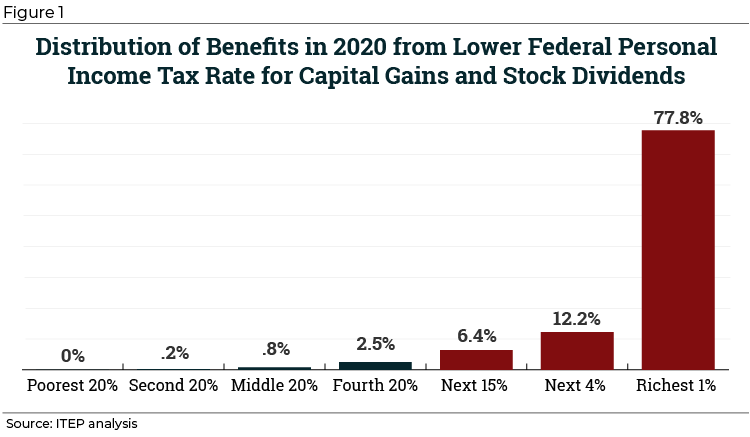 The estimates in Figure 2 assume the ordinary income tax rates (which would apply to capital gains under this reform proposal) would not change throughout the coming decade. For example, the top ordinary personal income tax rate would remain 37 percent and combined with the ACA’s tax on investment income, the top tax rate on capital gains would be 40.8 percent. However, if Congress makes no changes to current law, personal income tax rates now in effect (which were enacted as part of the Tax Cuts and Jobs Act, or TCJA) will expire after 2025. The top ordinary income tax rate, for example, would revert to its pre-TCJA level of 39.6 percent, and combined with the ACA tax, the top tax rate on capital gains would be 43.4 percent. If this happens, the revenue raised could be even higher than what is illustrated in Figure 2. In other words, Senator Sanders’ proposal to tax capital gains upon the death of the taxpayer would exclude such gains to the extent that the deceased taxpayer’s income that year was below $250,000 even when including those gains. For example, if a taxpayer had adjusted gross income (AGI) of $100,000 during the year he died and the IRS determined that the unrealized capital gains on his assets totaled $300,000, then $150,000 of those gains would be excluded. The other $150,000 in gains would be added to his income for his final income tax return. Taxing unrealized capital gains on gifts is also necessary to close a related loophole allowing donors to deduct the appreciated value of assets they give to charity. Under this proposal, if a taxpayer purchases an asset for $10,000 and then donates it several years later for $20,000, the charitable deduction of $20,000 would offset the $10,000 of income used to purchase the asset and the $10,000 of capital gain on the asset. This would close an existing loophole that allows the taxpayer in this example to deduct the full $20,000 amount even though the $10,000 gain was never taxed. The tax code typically does not allow a deduction for income that was never taxed. But the existing loophole allows what is effectively a double deduction for the $10,000 gain which is not taxed and is also deducted. A more complex way of thinking about the deemed mark-to-market is the following. The tax rules would assume that the capital gain on the asset at the time it is sold, which is $20,000,000 in this example, accrued at a constant rate over the years the taxpayer owned it, which is 17.5 percent in this example. When the asset is sold, the tax rules would look back at each of those years and ask what the taxpayer would have paid in taxes each year on those gains if the asset was a publicly traded asset subject to mark to market. The future values of those tax payments (the value of those payments increased by the rate at which the asset appreciated) would add up to the total tax payment due during the year the asset is sold. While non-publicly traded assets are difficult for the IRS to value until they are actually sold, the owners of such assets themselves often have at least a rough idea of how much their value is changing over time. The deemed mark-to-market rules would therefore allow such a taxpayer to value her non-tradable assets each year and prepay the tax on the gains. She would have an incentive to do so because any tax due on the gain for a particular year would grow — at the rate at which the asset appreciates (17.5 percent in this example) — until the year the asset is actually sold and the tax must be paid. For example, if the taxpayer in the example above valued her asset perfectly each year she owned it and prepaid 40.8 percent of the gains in each of those years, the sum of the future value of those tax deposits would equal $11,682,000, which is the tax that would be due the year the asset is sold if no prepayments had been made. This is the tax necessary to reduce the after-tax asset from $25,000,000 to $13,399,000, which, as explained above, is the same after-tax asset that taxpayer would be left with if it had been subject to actual mark-to-market taxation. Miller’s article explains many more aspects of his proposal, including how income and asset thresholds might work, how losses would be treated, how to estimate the potential revenue gain, and many other details. For more information, see the ITEP Microsimulation Tax Model Overview, https://itep.org/itep-tax-model-simple/. In the case of like-kind exchanges, this adjustment is made only to the portion of like-kind exchanges used by individuals rather than corporations. Corporations to not receive a preferential rate for capital gains.